While Adidas is the official Olympic sportswear sponsor, Nike is doing a pretty good job of stealing the German brand's thunder. Watching the athletics over the past couple of days, it's been pretty difficult to miss the sea of fluorescent yellow running shoes on the track. And unfortunately for Adidas, these eye-catching shoes are part of Nike's Volt range. A spokesperson for Nike told just-style today that over 400 athletes (mostly Nike sponsored) are wearing the Volt range in the games, with the majority in athletics, but also boxing and fencing. 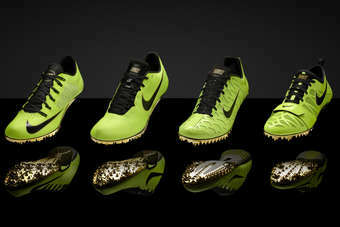 Even South African sprinter Oscar Pistorius' prosthetic spike plates have the ubiquitous Nike swoosh on them. Nike says over 20 medals have been awarded to those wearing the shoes as of this morning. The company's 'Find your Greatness' campaign also seems to be getting a positive response. The campaign features ordinary athletes competing around the world (outside the UK) in places that happen to be called London. Indeed, an online survey of over 1,000 US consumers at the end of July found some 37% of respondents thought Nike was an Olympic sponsor, and only 24% answered correctly that Adidas is one, Ad Age reported. The importance will not be lost on either brand, with research by the NPD Group (unsurprisingly) finding a spike in sports footwear sales during the months of high-profile sporting events. It said that over the past four years, basketball footwear sales increased in February, the month of the NBA Basketball All Star game, during the back-to-school period in August and during the December holidays. NPD chief industry analyst Marshal Cohen highlights the issue faced by Adidas at the moment, saying that using platforms like the World Cup or the Olympics to give a brand a lift is "never a guarantee due to the oversaturation of brand sponsorships". "The ultimate prize is the emotional association award - the needle will move when consumers connect your brand with an event, team, and athlete they are very passionate about," Cohen adds, something Nike seems to be doing quite well, despite not having paid for the privilege. I doubt that Adidas would suggest its US$201m sponsorship was a waste, as it emphasised last week that it is closing the gap on Nike in the UK, increasing its market share by two percentage points, with UK sales up 24% so far this year. Nike seems to be pinning its hopes on gold in the field, and Adidas may just have to settle for silver.